A fleet of over 300 premium vehicles driven by experienced, professional chauffeurs. Immediate refrigerated transport by mini-cargo and regular vans, or box trailers equipped with hydraulic lifts. Over 100 minibuses and deluxe coaches holding from 16 to 62 people, driven by the top professionals for group transportation. Public passenger transport services in the area of Bologna and Ferrara. 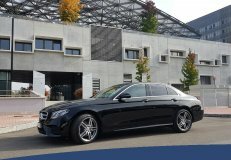 Our comfortable, prestigious “Auto Blu” are driven by discreet, distinguished, professional chauffeurs for your corporate or private transport needs. Modern and comfortable minibuses and coaches, driven by discreet, distinguished, professional chauffeurs to meet your corporate or private transportation needs. A high-quality, chauffeur service in luxury sedans or minivans with trusted drivers. Totally dependable drivers at the wheel of coaches or minibuses holding anywhere from 16 to 62 passengers means a high-quality charter service. Car rental with driver service for pick-up and drop-off service or on an hourly basis in prestigious cars with reliable drivers. A versatile fleet of vehicles consisting of mini-cargo and regular-sized vans or box trailers equipped with hydraulic lifts, for urgent or scheduled transport. Safe and comfortable transfer services for large and small groups alike aboard chartered buses or minibuses with driver. Late model sedans for up to 4 passengers and minivans for up to 8, equipped with every comfort and driven by expert drivers. Minibuses with up to 16 seats and coaches seating up to 62 passengers, fully outfitted with every amenity, driven by competent, reliable drivers. Car hire with chauffeur service to take you safely anywhere in Italy in style and comfort. Immediate or scheduled transport by means of a full range of vehicles of various capacities towards all destinations. Chartered coaches or minibuses with expert drivers for any destination, in Italy or in Europe. COSEPURI offers chauffeured car and bus rental services, as well as merchandise delivery and local public transportation. COSEPURI’S car rental with driver services are available in Bologna, Milan, Rome, Imola, Ferrara, Reggio Emilia and Firenze through its network of qualified chauffeurs, it operates everywhere in Italy. COSEPURI’s fleet is made up of prestigious and comfortable luxury vehicles, chauffeured by distinguished, discreet and professional drivers. They are entirely in compliance with safety regulations and with the requirements of salary, tax and insurance contributions. Go to the QUOTES AND RESERVATIONS section to calculate the cost of your car hire with driver, reserve and pay directly! Our car rental with driver services can also be booked through the COSEPURI MY DRIVER free APP that you can download from the APP STORE e GOOGLE PLAY , or by phone, fax or email. 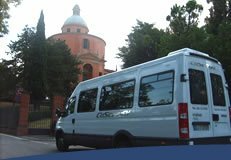 COSEPURI coach and minibus rental with driver services are available throughout Italy. 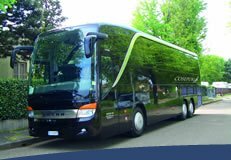 COSEPURI has top of the line coaches with the latest in rider comfort, driven by highly experienced and professional drivers. Contact us today for a customized quote for the hire of a chauffeured minibus or coach for your next group trip! You can contact us by phone (+39 051 517070) or fax (+39 051 6331054), by email (cosepuribus@cosepuri.it), or online with the request form in the CONTACTS section of this website. 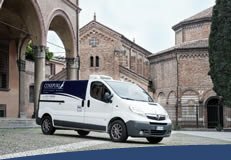 COSEPURI delivers goods and freight, documents, time-sensitive packages, food and pharmaceuticals in temperature controlled vehicles bound for any destination in Italy or abroad. Transport services are performed in insulated or refrigerated vehicles with hydraulic tail lift and operated by specialized drivers. Request your quote for transport via mini-cargo or van, by phone (+39 051 518080), or fax (+39 051 519031), by email (cosepurimerci@cosepuri.it), or online with the request form in the CONTACTS section of this website. Our Call Center operates 24 hours a day and every day of the year. Our vehicles are immediately available even in the case of extreme urgency. Request our car/bus hire with driver or delivery services immediately in the area PREVENTIVI E PRENOTAZIONI. You will find our prices are competitive and have no supplemental fee for the reservation. 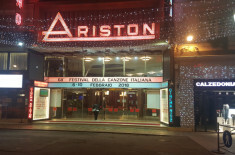 Sanremo 2018 has started and, with great satisfaction, Cosepuri has been entrusted to manage the transfer services necessary to the 68th Italian Song Festival. 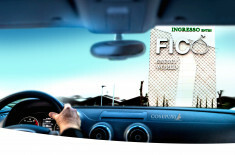 On November 15th opens in Bologna FICO EATALY WORLD! is the world’s largest agri-food park. In more than 40 years, we have driven a long way offering high quality service 7 days a week/24 hours a day through our Call Centers, with special attention to comfort, image and discretion in every aspect of your trip, whether it be within the city, outside of city limits, for institutions or private clients, with the same guarantee of safety and reliability. Are you a Cosepuri shareholder? Enter in your reserved area and see the information specifically dedicated to associated companie.